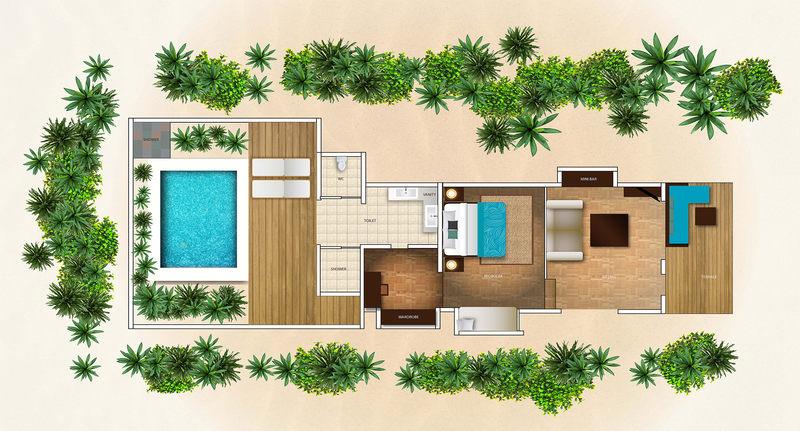 Offering complete privacy, the 110-sqm Deluxe Pool Villa is located on its own private garden and fronted by a shaded patio. Lounge in the living area and bathe in the elements in your secluded outdoor courtyard with oversized plunge pool deck and outdoor shower. Bask in the sunshine in your private garden courtyard. One of its kind,the Deluxe Villa with Pool offers ultimate privacy, with split-level interiors, a private outdoor shower and intimate garden courtyard. Nespresso coffee machine with complimentary coffee capsule. Private garden shower. Private oversized plunge pool. Branded linen. Pillow menu. Snorkelling equipment.